Tropicana Casino - Currently as low as $100 per night! The Tropicana Casino is one of the better known casinos in Atlantic City, offering unsurpassed restaurants and entertainment. The Quarter opened in 2004 and is dining, entertainment, and retail megaplex. The property also offers a heated indoor swimming pool, an outdoor pool, and a full-service beauty salon. For business travelers, there's a fully equipped business center with copying, faxing, and Internet access workstations, as well as secretarial and design services available. We just found one of the BEST unadvertised discounts on lodging in Atlantic City! Directly across the street from the Tropicana Casino and just one block to the beach and famous boardwalk is the Atlantic City Econo Lodge. Current rates are an unbelievable $40 per night! Best Western Envoy Inn - This hotel is centrally located in uptown Atlantic City at New York and Pacific Avenues. It is close to restaurants, casinos, and one block from the beach and boardwalk. Howard Johnson Inn - Rates as low as $45 per night! Beautifully decorated 81 rooms in the heart of shopping mecca and easily accessible from Garden State Parkway. Just minutes from New York City with Broadway shows, Statue Of Liberty, Radio City Music Hall, Lincoln Center, and Wall Street. Very close to the Meadowlands Sports Complex, Giants Stadium, and Harness Horse Racing. Super 8 Motel - Current rates as low as $57.22 per night! One-half block to beach and boardwalk with large rooms with refrigerators and climate control, outdoor swimming pool. Sheraton Convention Center Hotel - This is a spectacular, 15-story, 502-room hotel that is connected to a new, state-of-the-art convention center. Ideally located at the gateway of the city, it's just steps from the world-famous Boardwalk and non-stop casino action. 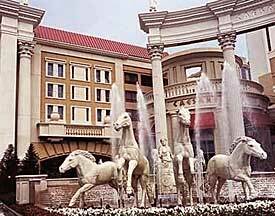 Caesars Atlantic City Hotel Casino - Built in 1979 but fully renovated in 1997, the glory and opulence of ancient Rome comes alive at Caesars Atlantic City. The empire offers the thrills of non-stop casino action, luxurious accommodations, gourmet and casual dining, three lounges and world-class entertainment. Guests enjoy top-notch boutiques, a luxurious health spa, an outdoor pool, tennis courts and 24-hour room service to pamper you around the clock. Comfort Inn - Current rates as low as $59.99 per night! Superior service, excellent value, and conveniently located in the heart of the casino district just 100 yards off the boardwalk. Howard Johnson Hotel Located in the Boardwalk block, this hotel offers a breakfast buffet each morning, rooms for physically challenged guests, catering to vacation and business travelers, with internet access in all rooms. Quality Inn Hotel - This hotel is centrally located and offers guests in-room coffee makers (ever been to Vegas and see how where you don't get one of these since they want you downstairs in the casino? ), high speed Internet access, balconies, banquet rooms, microwaves, swimming pool (in warmer weather), room safes, cable TV, whirlpools, and more. Econo Lodge Boardwalk - Located across from the Sands Casino, this hotel sits on the Boardwalk block. Bally's is just one block away, and Trump's Taj Mahal, the Showboat Casino, and Merv Griffin's Resorts International are all just a few minute's walk away. Econo Lodge Beach Block - Located at 3001 Pacific Avenue and across the street from the Tropicana, it's just one block to the beach and boardwalk and near other casinos and attractions. Room rates vary from a low of $45 per night to a high of $425 per night. Rodeway Inn - Located at 3601 Pacific Avenue, this hotels is one block from the Hilton Casino and the beach, and close to all the other casinos and attractions. Room rates vary from a low of $50 per night to a high of $300 per night. Copyright ©1999-2006 - Reproduction prohibited.